Sden originates in the pre-Crisis DC Universe as a foe of the Legion of Super-Heroes. But as he only appeared once and nothing particularly ties him to that era, he may be useful to GMs. His home planet and lifespan are unrevealed, so he could be around in the 21st century. Maybe he fights your PCs for possession of the Magna Crystal, and after they win, it takes him 1000 years or so to locate it again. He may try to con your PCs like he did the Legion. Or maybe he’s leading an alien invasion. He might show up in a magic-based campaign as part of a cabal of evil sorcerers a Dark Circle or Court of Ardor type. 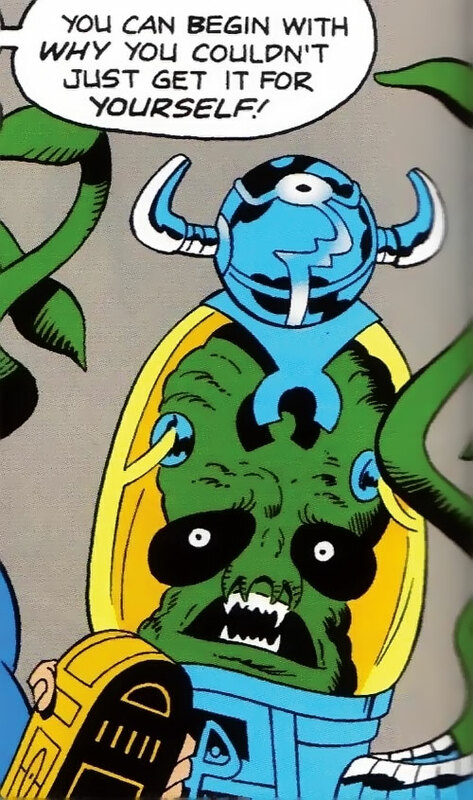 And though I’m not really familiar with the mythos, given his appearance, maybe he’d fit in a Cthulhu-influenced game, as one of the Star-spawn of Cthulhu. Devotees of that material may have more specific suggestions. Oddly, the name “Magna Crystal” doesn’t appear in the story see “Clear as Crystal” below for details. I’m using “Magna Crystal” for no valid reason except that I like it. Base Of Operations: Last seen on his way to the prison planet Takron-Galtos. Height: Oddly variable anything from 6’6” to about 12’. Eyes: White. Beady. Two. Hair: Non-existent at first glance. I’m not taking a closer look – Sden’s icky. Open deep fissures in the earth. He’s also a teleporter, and is skilled in teleporting out of the way of attackers. He apparently has access to a wide range of other spells and occult knowledge. He’s also a fast-talker with a gift for manipulation. An alien creature, Sden has four tentacles and two tails. During his one appearance, the McGuffin that Sden had the Legion obtain for him was a magical crystal. It was locked in an ancient case and lying in an active volcano. Sden told the Legion that this was the Crystal of Catastrophe, a dangerous object which his people had jettisoned into space long ago to keep it from harming anyone. In fact, the Crystal was an amplifier of mystic energies. 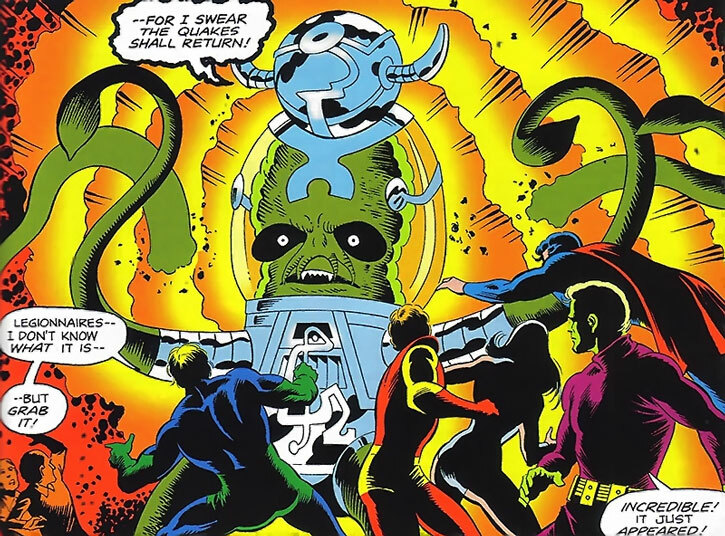 Sden coveted this artefact, as it would make him a sorcerer of power surpassing even Mordru. The Crystal is never actually used in this story. And at the conclusion of the issue, Superboy takes the Crystal with him back to the 20th century to ensure that Sden will never obtain it. Superboy then, in <>Adventure Comics #453, has a bizarre adventure with a juvenile Barbara Gordon. Barbara is away at camp, upset about being teased, when Clark walks by with the concealed Crystal. The talisman picks up the girl’s desire to be a superhero like Superboy and empowers her appropriately. But Barbara is too immature and inexperienced, and her powers are a menace. So Superboy tosses the Crystal into the sun, apparently destroying it and turning Barbara back into a normal girl. 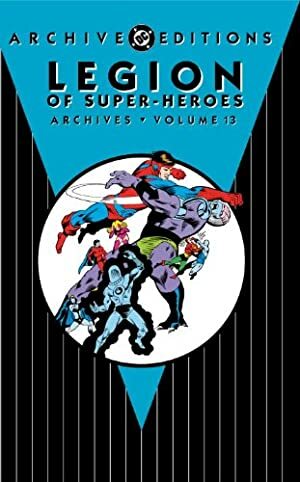 Yes, it was the Silver Age . Well actually, it was the Bronze Age . Anyway…. The crystal’s actual name is unclear. It might be the Crystal of Catastrophe. Or that might just have been a lie of Sden’s, given that he was trying to make the crystal seem dangerous. It’s referred to as the Magna Crystal in the Adventure Module Mad Rook’s Gambit, put out by Mayfair Games for the DCH RPG. That name is never used in the comics, though. The crystal’s actual origin is unclear. Sden’s story implies that it originated with his people, but…well…he was lying, so that might be a lie too. Mad Rook’s Gambit claims that Sden’s people created the Magna Crystal, and that it was one of a number of talismans that proved too powerful to be safe. As a magnifier of magic, the Magna Crystal was the ultimate prize for a galaxy of sorcerers, and a devastating war broke out over possession of the crystal. Eventually, the survivors realized that keeping the gem around would lead to their ultimate downfall. But they were too weakened from battle to destroy it, so they cast it into the intergalactic void. Millennia later, Sden discovered its existence in ancient records and tracked it to the planet Remor, in United Planets space. This intriguing history is all apocryphal, however. 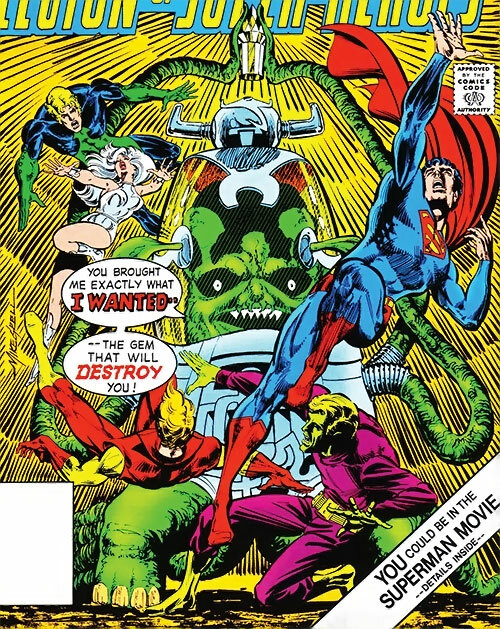 Adventure Comics #453 seems to indicate that the crystal originated with Mordru. But it’s hard to believe Mordru would have left such a thing lying around, and I’m not convinced that this wasn’t a simple error. Plus, that story, with Superboy encountering the future Batgirl/Oracle as a child, is certainly not in continuity these days…whatever “continuity these days” means. I’m tempted to suggest some link with the Gemworld. Or the Zodiac Crystals associated with Arion. Or even a link with Oa. After all, it is a gem which amplifies power and responds to will as it responded to Barbara. Which leads to the third point the crystal’s actual capabilities are also unclear. Sden never gets a chance to use it, but he believes it would amplify his power to the point that he could conquer the galaxy. Dream Girl’s vision (of a future where Sden, using the Crystal, defeated both Mordru and the LSH) would seem to back him up. Mad Rook’s Gambit suggests that the Mystical Attributes and Powers of a person holding the Magna Crystal would be tripled, with a maximum of 40 APs for any one Power or Attribute. That seems about right for Sden’s Powers. But may be a bit much for the Attributes. Plus, it doesn’t exhaust the crystal’s capabilities. Barbara Gordon used it unconsciously, and without touching it, to gain powers rivaling Superboy’s. So it might better have some combination of Omni-Power, Mutation, Power Reserve, Enchantment, Sorcery, etc.. Ultimately, it seems likely that the Magna Crystal is powered by plot devicium. Finally, the crystal’s ultimate fate is unclear. 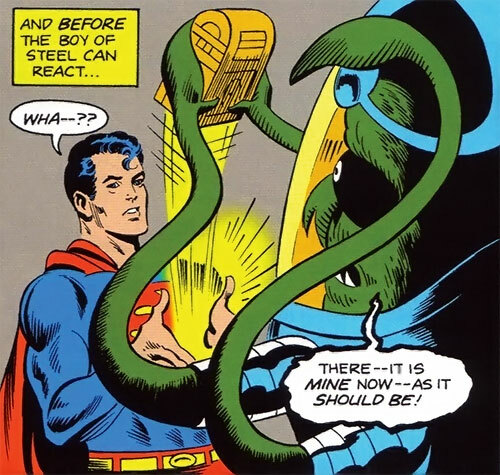 Superboy apparently threw it into the sun, but that story’s continuity is already suspect. He was vulnerable to magic. Didn’t yet know any magicians in his own time. And they could easily have gotten it to the White Witch for safekeeping. Mad Rook’s Gambit has it somehow surviving the super-toss into the sun (well, that module also says it has a BODY of 50) and drifting back into the 30th century. But that’s not in continuity either. So feel free to use the Crystal or not, as you need. 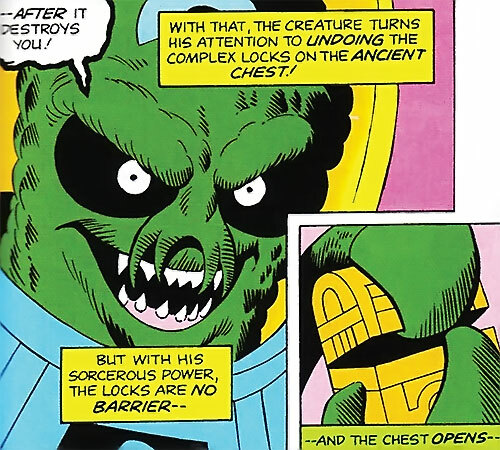 Sden is an alien sorcerer who battled the Legion of Super-Heroes. He claims to be from a galaxy called Trevenon. He encountered members of the LSH on the planet Remor and asked them to help him get a magical crystal. 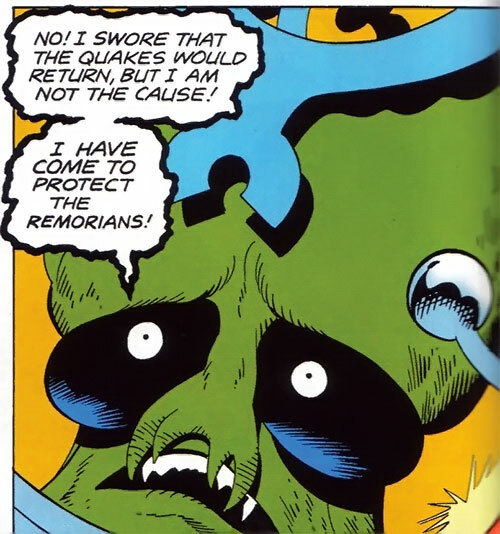 Sden’s story was that the mysterious planetquakes and volcanic eruptions plaguing the Remorians were being caused by “the Crystal of Catastrophe”. He explained that said Crystal a dangerous mystical talisman. It allegedly had been sent into the intergalactic void by his people to keep it from harming anyone else. Sden claimed that he had learned that the crystal had used its enchanted energies to drift to Remor “seeking new worlds to destroy.” Implying that the crystal was both aware and evil, Sden stated that it throve on disaster and would soon shake Remor apart. His own magics were too weak to affect the gem directly, or so he said. That allegedly prevented him from destroying it or teleporting it off-planet. But if the Legionnaires could recover it from the volcano where it lay hidden, Sden could take it back to the void, where it and Remor would be safe. But Sden was lying he was the actual cause of the quakes. In truth, getting his tentacles on the so-called “Crystal of Catastrophe” was Sden’s first step toward conquest. 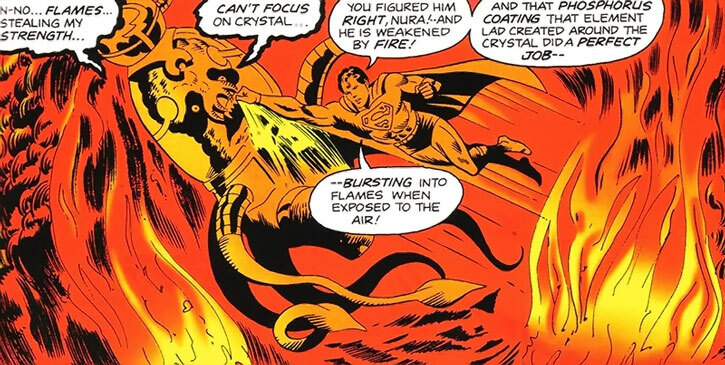 The crystal would actually amplify his powers to an incredible degree, making him more powerful than Mordru or the combined membership of the LSH. But because Sden was vulnerable to fire, he needed help getting the crystal out of the volcano. 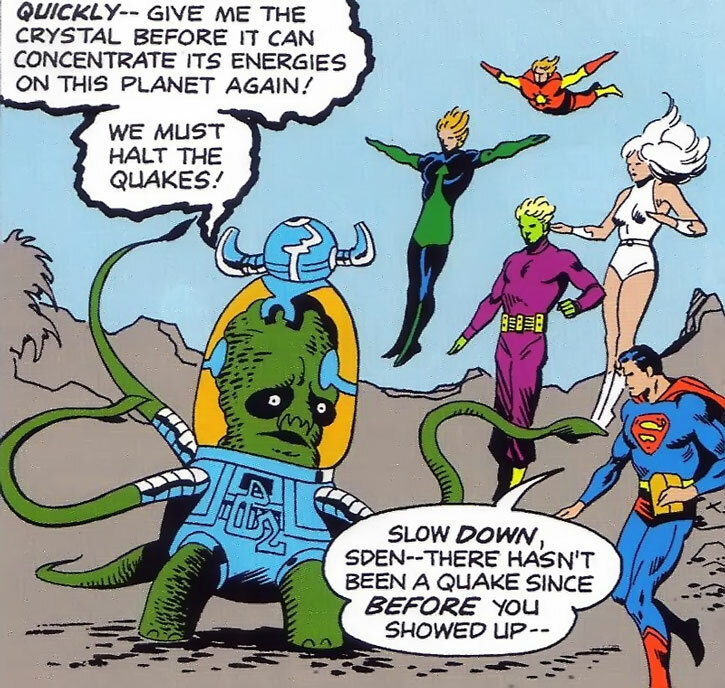 So he caused the quakes, blamed them on the crystal, and tried to trick the Legion into bringing the crystal to him. However, Dream Girl was suspicious of his story. Therefore, she convinced the Legionnaires to take precautions. She had noticed that he shied away from Sun Boy, so the Legion rigged a fire trap. Element Lad coated the crystal, which was locked in an ancient chest. When the Legion brought the chest to Sden, he snatched it, attacked the Legion with quakes, and immediately began gloating. But when he opened the chest to the air, the coating of phosphorus burst into flame. This paralyzed Sden and robbed him of his power. The Legion sent him to be locked up in a special cell on the prison planet of Takron-Galtos. His subsequent fate is unknown, but he presumably remains locked up and was transferred to the new prison planet, Labyrinth, when Takron-Galtos was destroyed in the Crisis on Infinite Earths. It should be noted that all the details of Sden’s origin, and of the crystals, came from Sden. And he was lying about some of it. It’s unclear whether anything he said was the truth. He may or may not be from another galaxy, the crystal may or may not have been known to his people, etc..
Several of the possibilities are listed above in the “Clear as Crystal” section. Sden is a huge and very alien creature standing at least 12’ tall (around 4 meters). He has a huge, egg-shaped head the size of a bean bag chair. Oddly, at times his size seems to dwindle to the point that he’s hardly taller than an average adult human. He has a green or brownish-green hide, two relatively short and stubby legs and a squat, oval torso. His eye sockets are large, dark crevices in which small beady eyes (white with a tiny pupil) are set. His wide “nose” (which may or may not be a nose) has four tiny tentacle-like growths rather than nostrils. Sden also sports four long tentacles and two tails. He wears a metallic outfit that may be some kind of environmental suit, despite leaving his legs and tentacles bare. It covers his torso, has a clear globe (possibly tinted orange, but that may have just been reflected light) covering his head, topped with a bizarre metal top, on which sits a Kirbyesque metal helmet. The back of his armor has a pod that appears to glow and may be a power source of some kind. Sden is a power-hungry, conniving sorcerer with grandiose aspirations of conquering a galaxy or two. He’s a trickster and con artist who will try to manipulate others into helping him by pretending to be a good guy. A fast-talker, he uses lots of exclamations to create a false sense of urgency and get people moving before they have time to think. His persuasive skills are good enough to compensate for the handicap of his appearance. 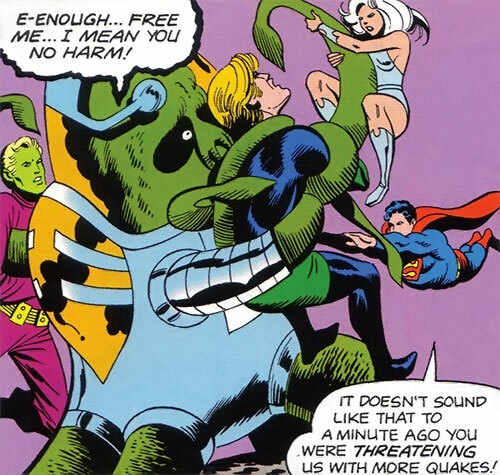 He tends to underrate the intelligence of the opposition, though, which is risky against the likes of Dream Girl or Brainiac 5. And he’s too quick to gloat when he thinks he’s won. Fairly standard super-villain behavior, there. Earth Control, Geo-Force, Growth, Illusion, and Teleportation are all Mystic Linked (+10 BC each). Acrobatics (Dodging) is a Powered Skill (-1 FC), Derived from Teleportation (-1 FC), and Mystic Linked (+10 BC). Thief (Locks and Safes) is a Powered Skill (-1 FC) and is Mystic Linked (+10 BC). None as far as we know. Loss Vulnerability (Fire, All Mystical Attributes, all Powers and Skills 0 AP Range), SIA (obtaining the Magna Crystal), Strange Appearance (but not by 30th century standards might have Creepy Appearance there, just because he’s of an unfamiliar species), Traumatic Flashbacks (triggered by fire). Dream Girl’s prophecy of what would have happened if Sden had claimed the Magna Crystal helps to verify that Sden does have some degree of Sorcery. Depending on your preferences, his Sorcery might be stronger, and the powers he shows may be derived from that. As with Sorcery, many of his Powers are probably stronger than represented here. For instance, he traveled between worlds somehow, but there’s no sign of a spaceship. Second, I gave him Growth, but I’m not sure the characters even notice his rather blatant size changes no mention is made of it, and he’s not seen Growing or Shrinking. Just sometimes he’s huge and sometimes he’s not. That could actually be played up for creepy effect. Third, I gave him Traumatic Flashbacks. I don’t know that there’s a particular trauma involved, but fire is likely to make him freeze up as well as weaken him so mechanically, Traumatic Flashbacks fits (and fits better than an Irrational Fear). If you want Sden to make use of the “Schools of Magic” concept, his distaste for fire (and light ?) might indicate an inclination for Darkness Magic. His Earth Control might also indicate a scholar in Elemental Magic, though obviously fire manipulation isn’t one of his strong suits. Sden’s four tentacles and two tails equate to Extra Limbs (x2). Two appendages are standard, the tails don’t seem to do anything, which leaves him two extra. 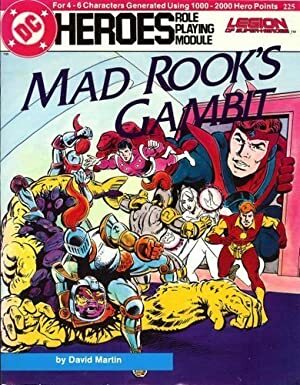 Helper(s): Mayfair Games DCH Legion of Super-Heroes sourcebook, v.1; Mayfair Games DCH Legion of Super-Heroes Adventure Module Mad Rook’s Gambit; Who’s Who in the Legion of Super-Heroes v.6 (Oct 1988); Darci. Source of Character: DCU (Superboy and the Legion of Super-Heroes).